Once you have enabled Accelerated Mobile Pages on your site, you can (should!) verify that the generated pages are valid. The AMP specification is very strict, and a syntaxically invalid page will not be indexed by Google, thus defeating most of the purpose. There are basically 2 tools you need to use. The AMP validator will check AMP syntax. Valid syntax is required and will prevent your pages to be used if not achieved. Then the Structured Data tester verifies that your AMP Pages have appropriate meta data. Since August 1 2016, structured data validation is no longer an absolute requirement for inclusion in search results. It is however needed for your AMP pages to be included in the top stories section, or in the AMP carousel. The console will either say something like AMP validation successful or throw a list of error messages, that you will have to fix in your original content. Use the AMP validator website, created by Google as well, available on this page. Just paste in your page URL, press the "Validate" button, and you'll see the validation result. Once your pages are all all green using the Chrome AMP validator, you should check that the meta data associated with it is correct and valid. Again, this is not an absolute requirement for AMP, but we recommend taking the time to setup proper structured data for best results. Using it is fairly simple, just enter the full URL to an AMP page (the one with the amp suffix at the end), and the tool will display whatever meta data it found in the page, and possibly any error. 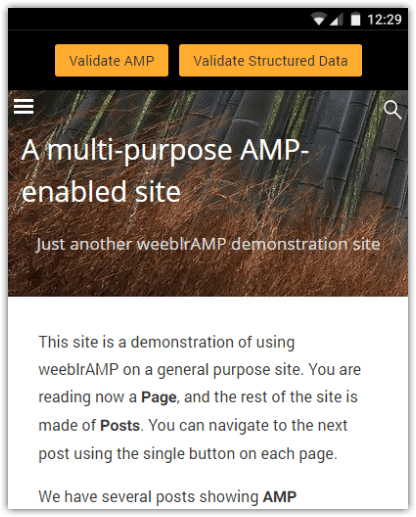 weeblrAMP automatically adds meta data to your page, as suggested by the AMP specification. This includes a representative image, a headline, publication and modification dates, an organization and an author information,... But it will also insert (unless you disable that) structured meta data extracted from your content, which should help search engines understand your site content more easily. This data is extracted from weeblrAMP settings, and from your site (automatically) most of the time. You can also add some custom tags in your content if needed, for instance if there is not image associated with a page, or that image doesn't suit you. The debug toolbar can be hidden through a setting on the System tab if not used.